With a capacity of 1250 LBS (550 kg), and an adjustable kickstand platform, this second generation dolly is built to fit your current bike, and your future bikes. 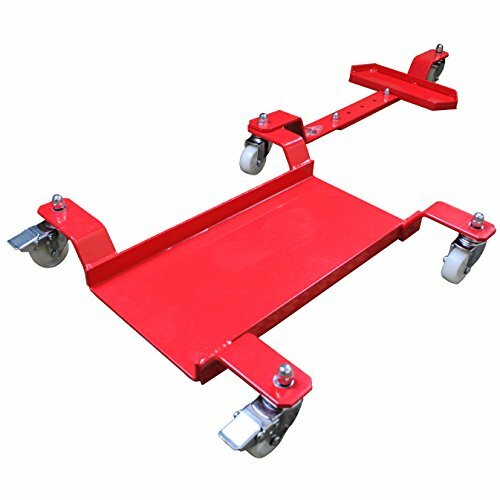 And with a durable industrial grade paint finish, and 8mm steel construction, it is built to last and keep looking great over the years (no need for protective plates like some other dollies). Locking casters, and a wide and low tire platform, mean you can ride your bike right onto the dolly, as apposed to pushing it on (as you would with a standard 'long rail' dolly). Not to mention, the unit's ultra compact size takes up a minimal amount of valuable space in your garage. Move your bike from one side of your garage to the other with next to no effort, pivoting it into the tightest of places (while saving your back!). GREAT WARRANTY: A 3 year warranty is standard and a testament to the quality of materials and construction. If you have any questions about this product by Big Horn, contact us by completing and submitting the form below. If you are looking for a specif part number, please include it with your message.